I don’t know how many pictures I’ve posted here that began with me sitting in my usual sport for my morning prayer, looking out the window, and having an idea for a photograph suddenly hit me. It’s a lot, that’s for sure. That’s exactly what happened here, and this started like many others with me sitting in our living room looking in a southwest direction as I prayed for the day, for my family, for my friends, and other things that were on my heart that morning. The sky was still dark at 5:45am so when I looked out I could clearly see the crescent moon being trailed by a dot that, thanks to my SkyGuide app, I confirmed was actually the planet Venus. My first thought, photographically speaking, was that I wished I had a better camera and lens to capture a shot of these two celestial bodies entwined in a cosmic dance for a short moment in those pre-dawn hours. Then I realized that I could probably get a decent image with my 70-200mm lens and Nikon D7100 camera, thanks to the huge amount of room those 24 megapixels offers when it comes to cropping. It was also super cold so I knew I didn’t have a lot of time to take the shot, but I figured I might as well give it a try and see what happened. I’ve learned that when taking pictures of the moon, exposure can be a tricky thing. You need a fast shutter since it’s actually moving pretty quickly across the sky, and anything less than 1/90 probably won’t cut it. You need to limit the amount of light coming in when shooting a full moon because it’s actually pretty darn bright (it is reflecting the sun, after all) and a low ISO helps to preserve the rich texture and details of the surface. All that is well and good but doesn’t help much with just a sliver of the moon in view, which is what I had to work with here. There just isn’t much light available, so you have to get things just right or your photo will turn out a muddy mess. Shooting at f/2.8 definitely helped because I could let in a ton of light, and when there’s not much to begin with, that’s always a good thing. I tried different shutter speeds and realized that I could get a reasonably good shot at 1/90 second, but anything below that was just too blurry from the motion of the moon. I set my ISO at 100 to get a super crisp, detailed shot and make sure I had enough photo information to work with in post in case I needed to do some editing. In retrospect I probably could have adjusted some of those parameters a bit (shooting at ISO 200 and 1/125 second, perhaps. And also zooming to 200mm, which I somehow forgot to do. The picture was shot at 180mm! Grr…) I used the good old focus-and-recompose technique (thanks back-button focusing!) to get the moon nice and sharp but then adjusting the composition slightly to include Venus just below and to the left. 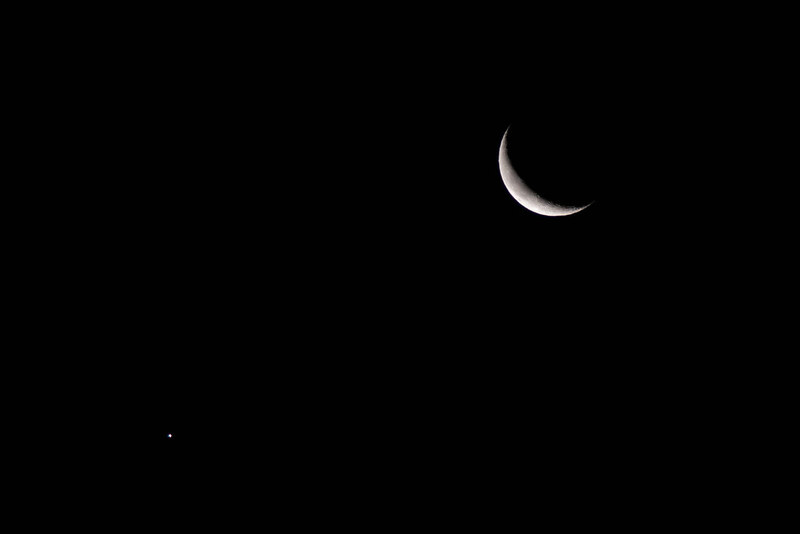 I’m really pleased with how this turned out, and though it would have been cool to get Jupiter in the shot as well, it would have required a massively different composition with a much smaller moon and more zoomed-out view overall. The shot you see here was cropped quite a bit but I really like the level of detail it contains on the surface of the moon, and I hope it’s obvious that there are two celestial bodies here, the moon and Venus, but hopefully people will pick up on that without too much effort. Usually I used to enjoy your captures from newsletter in my inbox. However this shot made me come to this site and comment. Great shot as always. I began to wonder for a quite sometime now on capturing the crescent and sometimes I went ahead and did photographed the moon, however I always ended in blury under-detailed photos. With this shot of yours, I’m again inspired to go out and have a shot. Maybe today (FullMoon) is ideal. Just to get clarified, have you used a tripod for this? Thanks for the comment, Stephan! The key to getting pictures of the moon is to remember that you’re basically pointing your camera at a small flashlight in the sky. If your photos are blurry you are probably using a slow shutter speed or high ISO. Try shooting with a fast shutter, low ISO, and small aperture. Your camera meter is going to say that the shot is underexposed, but when you’re shooting something as bright as the moon you don’t want to let in too much light. I didn’t use a tripod and you probably won’t need one either. Nice shot of a sliver of silver!